With the temperature dropping this time of the year, many of us tend to hibernate inside our homes. But, hibernating is for bears! 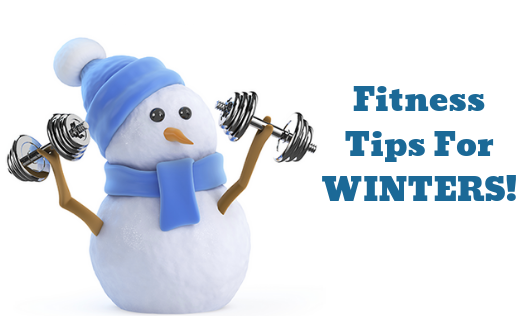 Hibernating isn't going to burn you any calories, so it's important to stay active and winter-proof your workout. While staying indoors might sound like a comfortable winter plan, taking care of your body is a priority. Just because it is cold outside doesn't make it an open season for an excuse for not exercising. There are yet multiple exercise options one can choose to participate in regardless of what the outdoor thermometer reads. Planning and writing down exercise sessions ahead of time makes it more likely you’ll do them. Set specific and realistic goals for an exercise program. For outdoor winter exercise, the right clothing will make a huge difference to your experience. If it’s really icy out, reschedule outdoor exercise—injuries take a long time to heal and it’s not worth the risk. Consider exercising indoors. Gyms are an obvious solution. You can choose from activities such as aerobic dancing, weight training, jogging, treadmill running, bicycling etc. Laying out exercise clothes and shoes the night before, packing your work bag, and planning both your outfit for the day, and your post-work-out breakfast will help you in saving time and sticking to your workout schedule. Cold temperatures make your muscles tight and therefore they are more prone to injuries. So, it's important to get them warmed-up prior to engaging in intense physical activity. It's just as important to stay hydrated when exercising in winter as it is in summer, even though you might not feel as thirsty. Be aware of post-exercise hypothermia. This is a result of the body reducing its production of heat while rapidly losing its existing heat stores. This can be avoided by adding clothing or quickly seeking a warm environment after completing your workout. Not to worry—the cold isn't doing any damage to your respiratory system. By the time the air reaches the bottom of your windpipe, it's been warmed to regular body temperature. The burning feeling is due to the low humidity of the winter air, which takes moisture from the cells lining your throat, causing them to become dehydrated and irritated. While it may seem like your joints are more stiff or painful in the cold, the culprit isn't the outdoor temperature, but the pressure in the air. As the pressure drops, the body's tissues expand, which can press against the joints and cause discomfort. You may not feel as sweaty or thirsty as you would in summer, but that doesn't mean you need less water—in fact, you may need even more of it. Cold, dry air can have a dehumidifying effect on the body. Also, proper hydration helps to keep the skin moist, preventing the cracking and chapping that can make you more vulnerable to bacteria and viruses, while also promoting healthy circulation and cardiovascular function. With the proper precautions and planning, you can safely maintain your winter workouts all the way through.